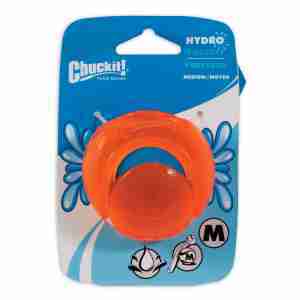 The Chuckit Hydro Squeeze Ball is a super bouncy and absorbent ball that your dog can play with on land and in the water. The polyester centre of the ball soaks up water, releasing it when your dog bites the ball. Perfect for summer play. The outside of the ball is made with pet friendly rubber and floats on water. This dog toy is also compatible with any medium Chuckit launcher.